A.A.L. Dias Matale District Group Corr. The bus gutted by the fire. Picture by A.A.L. Dias, Matale District Group Corr. 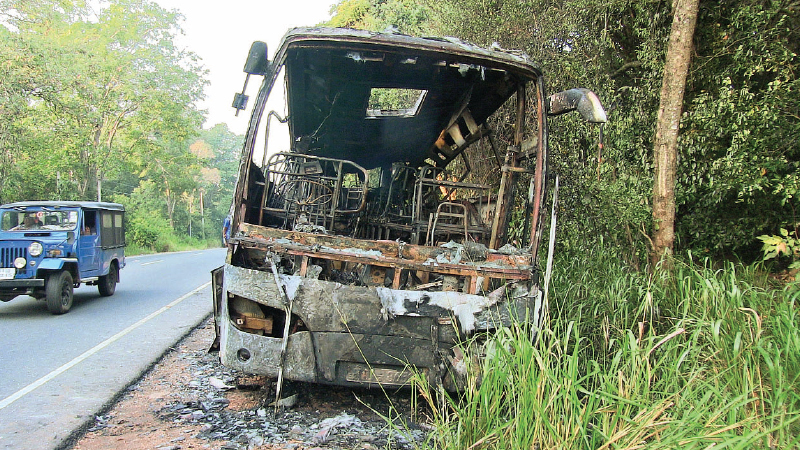 A luxury bus running on the A6 Road from Ja-Ela to Batticaloa caught fire near the Digampathaha junction during the wee hours of yesterday, Sigiriya Police said. The fire had erupted from the bus' engine. It was also revealed that the bus had been sent for repairs recently as well. The passengers had evacuated the bus before it was destroyed. Investigations are continuing.